Missed all the controversy surrounding 3D printed weapons and their potentially disastrous effects or not, depending on who you’re asking? 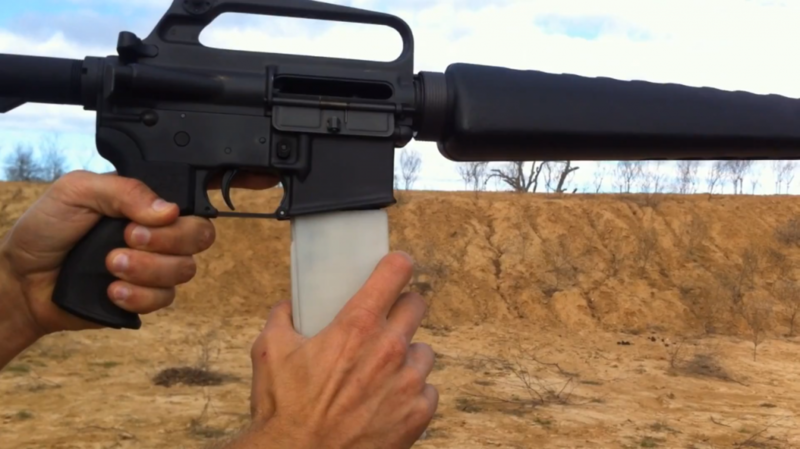 Rest assured, for we now have what is believed to be the world’s first 3D printed rifle being successfully test fired. Well, okay, maybe not 100 percent successfully, given that its barrel split after it fired the first round, but it did fire instead of just blowing up, so that should count for something. The rifle, named the Grizzly, is shown in action in a video posted on YouTube. The video was uploaded by a user named ThreeD Ukulele, who apparently is passionate about creating 3D models of musical instruments and especially, you guessed it, of the ukulele. The clip shows the Grizzly clamped to a workbench and a man, who is presumably the YouTube user, firing it from a safe distance, with a piece of string. The rifle, printed with a Stratasys Dimension 1200es, fires a .22 caliber bullet, but the detachable barrel and the receiver that houses the guns’ operating parts are cracked in the process. The Grizzly was obviously inspired by the Liberator – the world’s first 3D printed pistol which was successfully test fired a couple of months ago, triggering a massive wave of criticism and leaving U.S. authorities in disarray over how to stop 3D printed weaponry from spreading. The answer, of course, is that they cannot be stopped, given that the blueprints for the Liberator were made available by its inventor and downloaded tens of millions of times. Since then, several U.S. states passed legislation enforcing restrictions and registration requirements for 3D printed weapons. The Grizzly, however, is a 100% Canadian product, even if it uses the same mainspring mechanism as the Liberator. In comments on the DEFCAD (the company owned by the Liberator’s creator Cody Wilson) forum, a user named CanadianGunNut and believed to be the same person as ThreeD Ukulele explained that he was originally planning to create a modified version of the Liberator, but that would have been illegal under Canadian gun laws. Instead, he created a rifle of his own design, which took him less than three days to build and is entirely legal, he said. Contacted by Ars Technica, the rifle’s designer said he has no plans to sell the weapon, but will make the blueprints available online after he completes the project. Check out the 3D printed rifle test fired in this video and let us know what you think in the comments section below.